One of the state’s best barbecue joints (and the purveyors of, very likely, the best banana pudding in the state) just celebrated its 60th year in business. Winston-Salem’s Hill’s Lexington Barbecue has been cooking barbecue over wood-fired pits since 1951. Read more in the Winston-Salem Journal. Hours: Tue-Sun 7:00 a.m. to 9:00 p.m.
Hill’s Lexington Barbecue occupies a handsome brick building with a red roof on a strange stretch of Patterson Avenue that is peppered with manufactured housing businesses and other light industry. 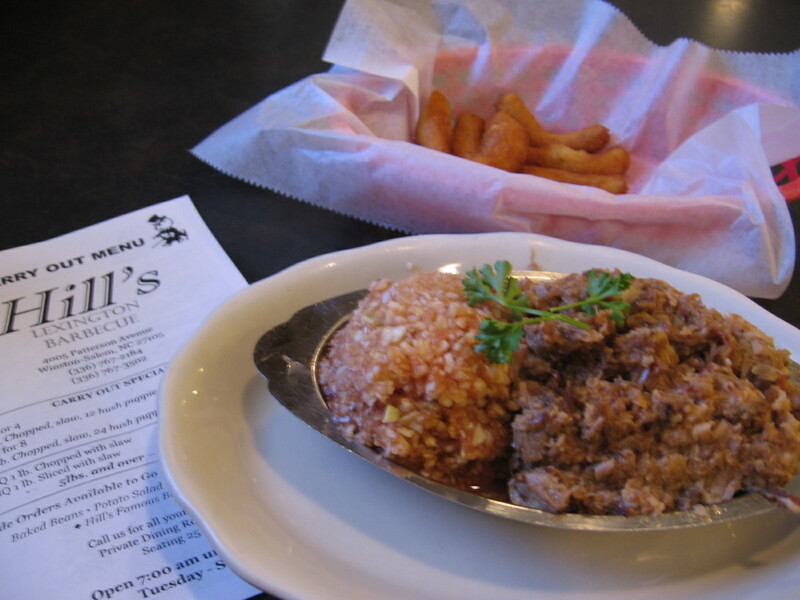 Hill’s also occupies a coveted spot on the NC Barbecue Society’s Barbecue Trail, as it is a traditional wood burner that has been around since 1951. 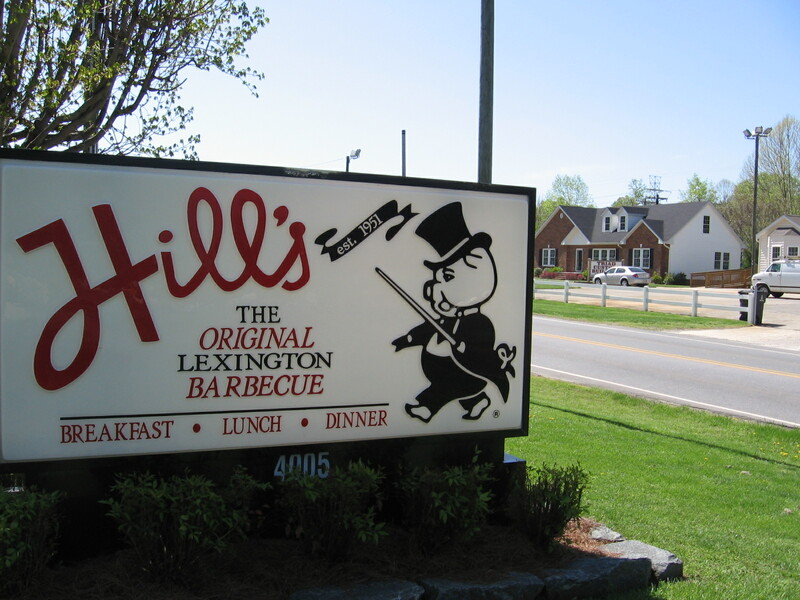 According to Jim Early of the NCBS, Hill’s was the first joint to use the phrase “Lexington Barbecue,” as founder Joe Allen Hill hailed from Lexington and wanted to lay claim to his barbecue roots when opening a joint in nearby Winston-Salem. Hill’s therefore claims, rightly so as far as I can confirm, to be “Winston-Salem’s Only Original Lexington Barbecue” and, less provincially, “The Original Lexington Barbecue.” As long as Hill’s keeps cooking barbecue of the quality I experienced on my visit there, they can claim whatever they please. 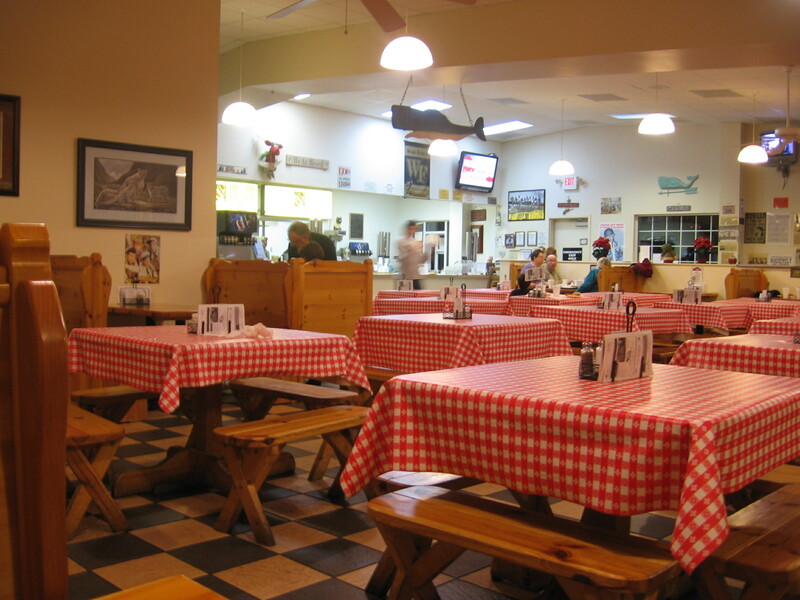 Hill’s Lexington Barbecue, still family owned in its 60th year, is a nice family restaurant in the North Carolina tradition. However, they take themselves a little more seriously (or maybe less so?) than most old school barbecue joints. 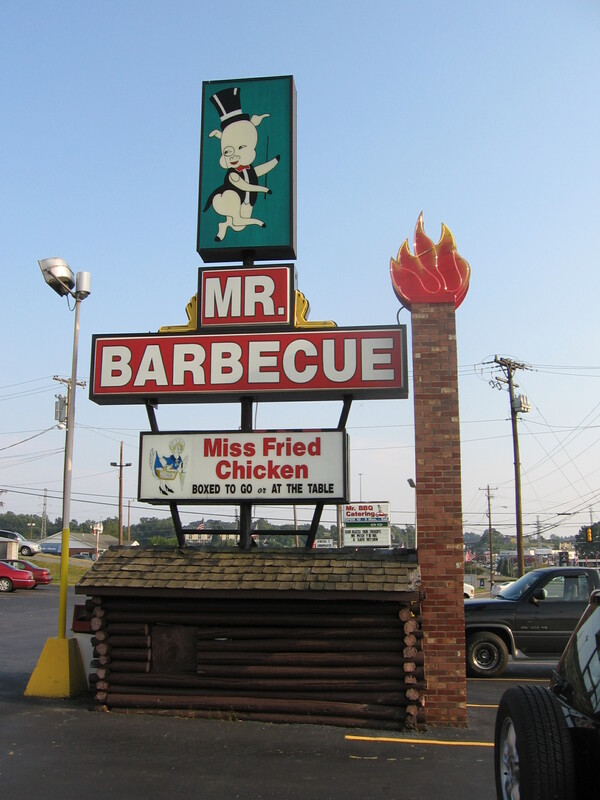 Their logo features a classy looking pig wearing a top hat and twirling a cane and, impressively, they serve their barbecue tray in a real tray. I don’t mean the standard flimsy wax paper tray, but rather a silver metal tray. And did I mention the pork is garnished with a sprig of parsley? It’s a nice touch, whether it’s sincere or a bit of tongue-in-cheekiness (I suspect the former, as barbecue is a pretty sincere business). Hours: Mon-Sat 11 a.m. to 8:30 p.m.
With a great name like Prissy Polly’s, which made it into my barbecue joint name hall of fame, it’s tempting to be Pollyannaish about the quality of the barbecue. The fact that the restaurant is named after the founder’s mother makes it even better. But despite the great name, Polly’s suffers from an identity crisis. And, leaving the name aside, the food they serve is just okay. I have to give Polly’s a lot of credit for being bold enough to start an Eastern-style BBQ joint in the heart of Lexington-style territory. And the Eastern-style ‘cue they serve is definitely the better of the types. I can’t really blame Polly’s for caving to local preferences either. Judging by the fact that they have stayed in business for 18 years and have a sparkling, large restaurant, adding Lexington-style ‘cue to the menu was the right decision. I simply don’t think their Lexington-style ‘cue is particularly good. Since Polly’s started out serving Eastern-style barbecue, let’s focus on that first. The biggest problem with Polly’s Eastern-style ‘cue is that it is not cooked over wood and the lack of care shows in a lack of flavor. Sadly, Polly has plenty of company in both the east and the west in terms of not using wood, but that doesn’t excuse them. Leaving that aside, Polly’s Eastern-style BBQ is moist and has decent flavor, which is enhanced by a slightly too salty but quite good vinegar/pepper sauce that accompanies it, though it appears to be machine chopped and is a bit mushy. I’d probably give their Eastern-style ‘cue a B- if I were grading it alone. 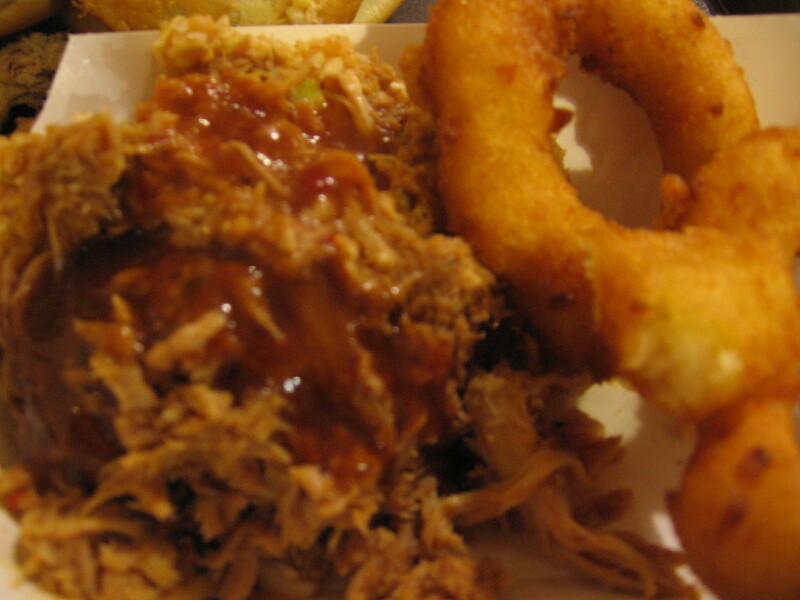 Polly’s Lexington-style barbecue fares worse. Polly’s actually offers two types of Lexington-style ‘cue. (Pay close attention, this gets a bit confusing.) 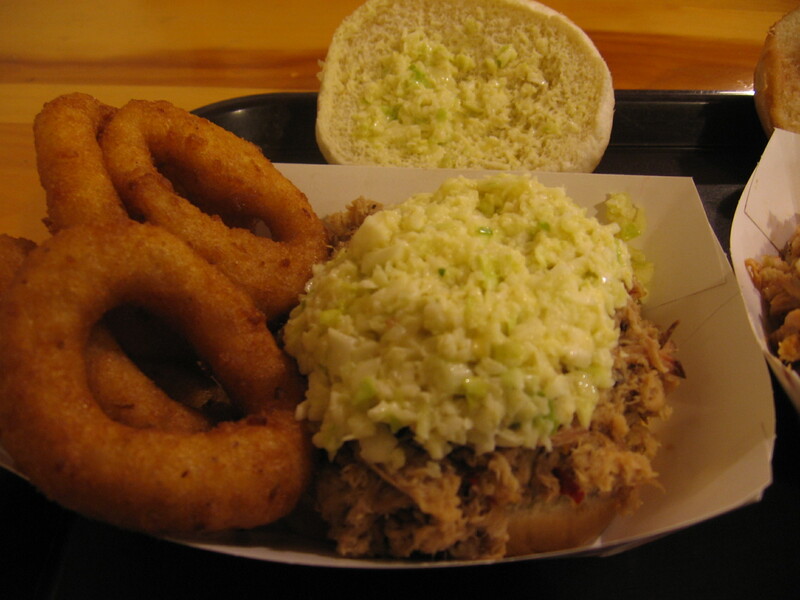 Polly’s original Lexington-style BBQ is called “Original Lexington,” and they have served it for years. It features a rather thick, sweet dip that has as much in common with KC Masterpiece or Kraft as it does with traditional NC style sauces. Recently Polly’s added another Lexington-style dip option, this one called “Traditional Lexington.” The dip used for the newer traditional version is significantly better than the original recipe, as it is much thinner and more vinegar-based, though it is still too sweet for my palate. The Lexington-style ‘cue was too heavily sauced in the kitchen and needed no added dip at the table. The most elaborate barbecue sign in NC? Hours: Mon – Sat 11 a.m. to 9 p.m.
From the vintage metal advertising signs on the walls to the traditional wood-cooked pork to the location just down the street from Vinegar Hill Road (too good to be true but it is! ), Little Richard’s feels like it has been around as long as the “other” Little Richard. But the joint, named after owner Richard Berrier, wasn’t around in the early years of rock ‘n’ roll. In fact, the joint only opened in 1991, making it a young’un by barbecue standards. Still, over the past 18 years, Little Richard’s has established a well-deserved reputation as a purveyor of authentic Lexington-style pork. I call this picture "barbekudzu."